Iron Yard Ventures was ranked as one of the top startup accelerator programs in the United States in both 2015 and 2016. Since 2012, IYV has invested in more than 62 early stage technology companies who have gone on to raise more than $100 million in follow-on funding. 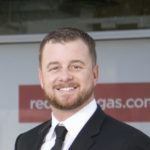 In Spring 2016, Iron Yards Ventures announced a hospitality-focused accelerator to downtown Las Vegas. This month, the team is celebrating the graduation of accelerator Batch 6, and credits the tech community in Las Vegas for their strong support of this program. 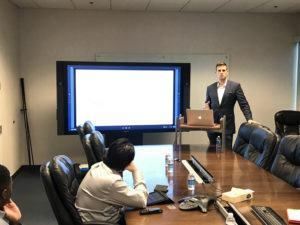 “So many people have been amazing in helping out our companies, but the best I think is yet to come,” said Ryan J. Negri, Managing Director of the accelerator. Negri points to accelerator mentor Robert Rippee, Director of the Hospitality Lab at the International Gaming Institute, as a valuable mentor to the teams in the program this fall. Rippee met with Nobal Technologies, one of the batch startups. The startup creates innovative and intuitive digital interfaces to enhance customer experience and is changing the way people interact with their world. Their innovative product is the iMirror. When Negri reflects on the challenges with Batch 6, he points to schedule logistics and the impact of work environments. Negri says he is considering skipping the extra curricular events next time around, both because of the scheduling challenges and the value they provided. This year’s cohort has teams of all stages, cultures and countries. Four of the batch talented teams are local to Las Vegas, while others traveled from Atlanta, Calgary, and Johannesburg. From notable VCs choosing to fund only startups that care about diversity to the well-documented gender gap in tech, this accelerator batch’s diverse team selection draw notice from those in the startup community. 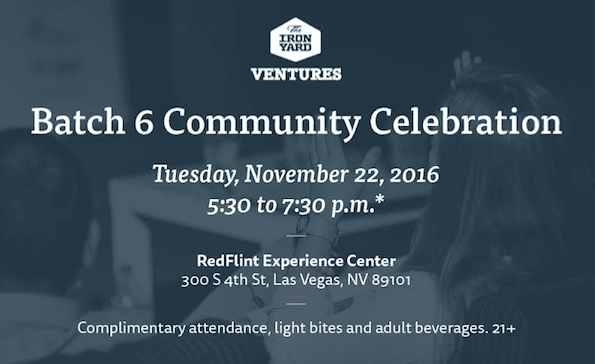 Iron Yard Ventures invites the local community to come hear the startups’ stories, celebrate their success, and enjoy a night with the bustling #VegasTech community. Join the fun on Tuesday, November 22, 2016 from 5:30 PM – 7:30 PM PST at the RedFlint Experience Center. More details here. Negri is already looking forward to the next batch in Las Vegas.